Idress H. Attitalla, S. Brishammar and S, Camyon. 1998. Effects of soil Moisture and Temperature on Incidence of Fusarium Wilt on Tomato. Journal of Mycology and Plant Pathology. 28: (3), 308-313. (ISI). Idress H. Attitalla, P. Quintanilla and S. Brishammar. 1998. Induced Resistance in Tomato Plants against Fusarium Wilt Invoked by Fusarium sp, Salicylic Acid and Phytophthora cryptogea. Acta Phytopathologica et Entomologica Hungarica. 33: (1-2), 89-95. (ISI). Idress H. Attitalla, P. Johnson, S. Brishammar and P. Quintanilla. 2001. Systemic Resistance to Fusarium Wilt in Tomato Induced by Phytophthora cryptogea. Journal of Phytopathology. 149, 373-380. (ISI, IF: 0.983). Idress. H. Attitalla, P. Maria Johansson, Sture Brishammar and Berndt Gerhardson. 2001. Pseudomonas sp. strain MF30 suppresses Fusarium wilt of tomato in vivo. Phyopathologia Mediterranea. 40, 234-239. (ISI, IF: 1.117). Idress H. Attitalla and S. Brishammar. 2002. Oxalic-Acid Elicited Resistance to Fusarium Wilt in Lycopersicon esculentum Mill. Plant Protection Science. 1, 128-131. Idress H. Attitalla, Jamshid Fatehi, Jens Levenfors and Sture Brishammar. 2004. A rapid molecular method for differentiating two special forms (lycopersici and radicis-lycopersici) of Fusarium oxysporum. Mycological Research. 108 (7): 787–794. (ISI, IF 2.92). Khaled, S. A., Faituri, M. Y., Idress H. Attitalla, El-Maraghy, S.S. M., and Issa, A.A. 2006. Physiology Responses of Wheat and Barley to Biofertilization. Assuit University Journal of Botany. 35 (2) 215–222. (ISI). Idress H. Attitalla, I.H. Bataw, A., Borowicz, J.J. and Brishammar, S. 2007. 16S rDNA analysis for characterization of Pseudomonas sp. strain MF30 isolated from Rumex acetoclla roots in northern Sweden. 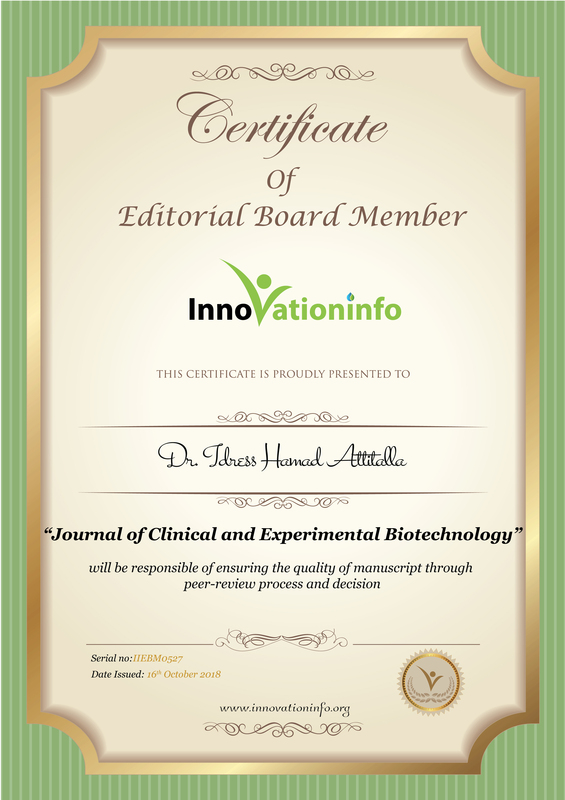 Arab Journal of Biotechnology. 10 (2): 97–106. (ISI). IdressAttitalla et al. 2007. Adaptation of some plant communities in Xerophytes and Halophytes in East Libya. Al-Mukhtar Journal of Sciences.16: 96–81. Balaji Meriga, Idress H. Attitalla, Mopuri Ramgopal, Anjaneyulu Ediga and P.B. Kavi. 2010. Differential Tolerance to Aluminium Toxicity in Rice Cultivars: Involvementof Antioxidative Enzymes and Possible Role of Aluminium Resistant Locus. Academic Journal of Plant Sciences. 3 (2): 53-63. P. Peter, A. Phaninatha Sarma, Md Azeem ul Hasan, S.D.S. Murthy and Idress H. Attitalla. 2010. Studies on the Impact of Nitrogen Starvation on the Photosynthetic Pigments Through Spectral Proprties of Cyanobacterium, Spirulina platensis;: Identification of Target Phycobiliprotein under Nitrogen Chlorosis. Botany Research International. 3 (2): 38-42. Idress H. Attitalla and Abobaker M. Alhasin 2012. Traits Biologically Interacting Azospirillum lipoferum Strain R23. Advances in Biological Research. 6 (2): 87-94, 2012.(PubMed). Evueh, A. G, Okhuoya, J. A. and Osemwegie, O., and Idress Hamad Attitalla. 2011. Evaluation Phylloplane Fungi as Biocontrol Agent of Corynespora Leaf Disease of Rubber (Hevea Brasiliensis Muell. ARG.). 2011. World Journal of Fungal and Plant Biology. 2 (1): 01-05. Idress H. Attitalla. 2011. Pharmacological Properties of Cassia nigricans Vahl Against Human and Veterinary Diseases. Asian Journal of Animal and Veterinary Advances. 6 (9): 886-887. (ISI, Scopus, Impact Factor 0.869). Idress H. Attitalla, Hanan M.A. El-Mesmary, Muftah A. Alhorer and Farj M. Shoaeb. 2009. Growth of the green alga Ankistrodesmus under various N/P ratios with spot light on the molecular taxonomy of its three species. Al-Mukhtar Journal of Sciences.24: 22-35. Idress H. Attitalla, Mikaeel Y. Faturi, Salleh A. Kahed and Faheem A. Bin Khayal and Bataw A. Fungal and Aflatoxin Contamination of Feed stuff Samples at El-Beida and Shahat Cities, Libya. (Accepted)-Sebha University Journal (Pure and Applied Sciences). Mikaeel Y. Faturi, M. Faraj M. Shoaeb., and Idress H. Attitalla. Tolerance of some Rhizobium leguminosae bv. vicia to different salt concentrations. (Accepted)-Al-Mukhtar Journal of Sciences. Ahmed A. Issa, Idress H. Attitalla, Hanan M. A. El-Mesmary. 2012. A first Report of Fresh Water Algae at Suluq lake, Libya. Topclass Journal of Microbiology. 1: (1) 018-024. Idress Hamad Attitalla. 2012. Wuling Capsule Can Improve Cognitive and Depression Defects of Stroke. Insight Ethnopharmacology. 2: 1-2. Idress Hamad Attitalla. 2013. Lipid Related Genes Could Have a Link with the Regulation of Blood Pressure. Science International. 1: 1. Idress H. Attitalla. and Faituri, M. Y. Mass Loss and Nutrients Dynamics of Decomposing Aleppo Pine Brown Needle Litter Grown in Al-Jabel Al Akdar Ecoregion. (to be published). 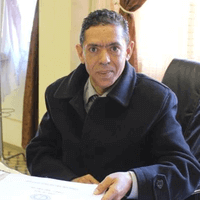 Mohamed Younes Abdelftah Hassan1, Omar Abdelateef Omar Saad, Magda Hassan Mahran, Ahmed Ismail Madkour, Suliman S Abdelrawaf and Idress Hamad Attitalla. 2013. A new medium for screening of gram negative bacteria in portable water. International Journal of Bioassays. 2: 379-381. (ISI, Scopus, Impact Factor 3.5). Idress Hamad Attitalla. 2013. Influence of Aspergillus flavus and A.terreus on the protein contents contaminated with Aflatoxins in Peanut Seeds at Al-Bayda Governorate, Libya. (to be published). Idress H. Attitalla. Some biochemical changes in Lycopersicon esculentum Mill. in response to inoculation with Phythopthora megasperma and its significance in induction of resistance against Fusarium wilt. . (to be published). Norlia Mahror, Idress H. Attitalla and Baharuddin Salleh. Screening and factors stimulate gibberellic acid production by Fusarium fujikuroi. (to be published). Idress H. Attitalla. Ibrahim A. A. Balal, Maziah Zakaria, Saad S.M. El-Maraghy. Detection of Aflatoxigenic fungi and Reduction of Aflatoxins in some Commercial Seeds and Grains in Al-Bayda Governorate, Libya. (to be published). Idress H. Attitalla. 2010. Molecular analysis of targeted FUM1 gene for the production of FB1 in Fusarium species associated with different host plants in Malaysia. (to be published). Norlia Mahror, Idress H. Attitalla and Baharuddin Salleh. Correlation between gibberellic acid production and pathogenic behavior of Fusarium fujikuroi that cause bakanae disease of rice. (to be published). Idress H. Attitalla, Saber E. Mansour, Laith K.T. Al-Ani, Aeshah M. Mohammed, Mikaeel Y. Faturi, Ibrahim A. A. Balal and Saad S.M. El-Maraghy. Influence of Aspergillus flavus and Aspergillus terreus in the protein value of the two varieties of peanut grains. (Poster at the International Mycotoxin Conference to be published - held at the Park Royal Hotel, Feringgi Beach, Penang Malaysia from 1st to 4th December 2010).